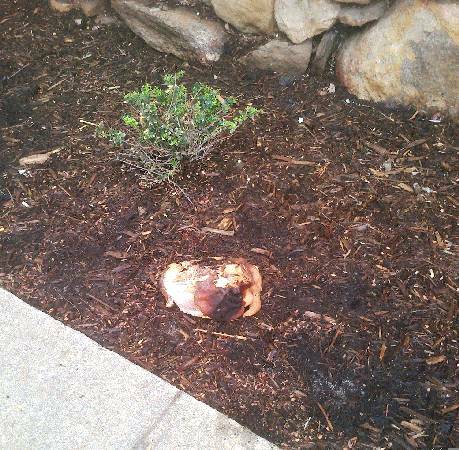 best of craigslist: Did you lose a ham? Did you lose a ham? Perhaps a bear broke into your kitchen and stole it from the counter where it was cooling, and then discarded it because it was overly salty. Or maybe you and some other scenesters you just met were snacking on it during Moogfest but then when you woke up Monday morning next to the trash cans in Chicken Alley it was gone. I'm not sure of all the possible scenarios under which someone might lose a ham. It's in worse shape than it was when I saw it last night, perhaps due to the rain or a random vagrant gnawing on it. The browned fat on the outside isn't so deliciously crispy looking this morning. It's a bone-in ham, not sure it's obvious from the photo, and it's been eaten on some, but there's definitely some serious meat left on it. Looks like it was pretty tasty in its day. Anyway, it's laying on the mulch in between the civic center and the sidewalk. I'm sure you'll be relieved to know where it is.